It was a busy day this past Tuesday, May 10, inside of the Salas Boxing Academy in Las Vegas, Nev. The facility, formerly known as the Bones Adams Boxing Gym, is ran by respected Cuban trainer Ismael Salas. 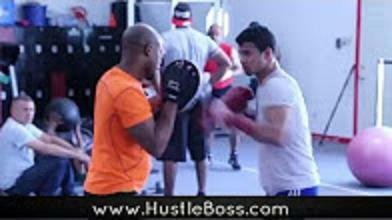 On Tuesday, the likes of IBF lightweight champion Rances Barthelemy, WBC lightweight champion Jorge Linares, and former two-division belt-holder Joel Casamayor were in training, but it was also the talent of an emerging amateur who caught our eye. 20-year old Rolando “Rolly” Romero often trains out of Johnny Tocco’s Boxing Gym but has been dividing his time between the two gyms in recent months. Romero isn’t always the most outspoken of individuals but his ability is definitely apparent. Take a look below for more of one of Las Vegas’ next rising prospects, Rolando Romero.